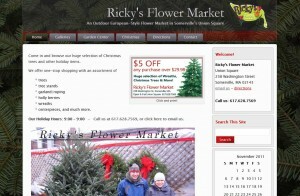 Just in time for the start of the holiday season, we’re proud to release a new site for Ricky’s Flower Market in Somerville, Massachusetts… Ricky runs a unique, European-style flower shop in Union Square, and was ready for an upgraded web look. Here, we were able to use the WordPress theme capabilities to create a holiday theme that can be switched to a spring theme with a few mouse clicks later in the season. The spring flower and pottery galleries are in place year-round to give site visitors a sense of the full shop capabilities.